Between the time Tom Brady emerged in 2001, and last seasons AFC title game versus Baltimore, the Ravens had faced Brady and the Pats five times. Baltimore beat Brady only once in those games.The 09′ playoff game, 33-14. Here’s a few things you may not know as I dive deep into the numbers. 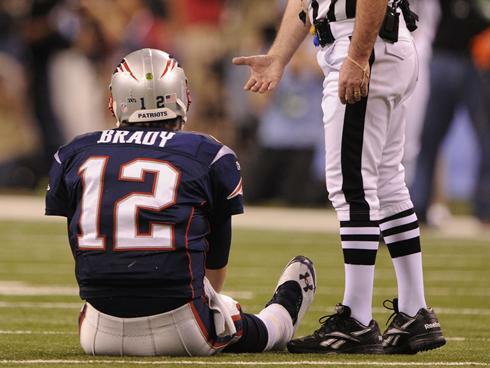 Including the playoffs, Tom Brady had lost 38 games in said time span. Not including the half game he played in which Drew Bledsoe’s injury gave Brady his debut. Also not including a game from week 17 of 2005 where he played just a quarter to avoid injury before the playoffs. In those 38 losses which he played the entire game, here are the average stats Brady and the Pats posted. Hardly a small sample size. Here are the stats from the five games the Ravens have squared off against Brady in that time span, and last years title game in question. The Ravens have come so close in years past to winning more of these games. Its evident since the last four losses are by less than a touchdown. As far as the numbers go, scoring the apparent necessary 27 points equals a win in all of these games. In the 2009 regular season matchup, Mark Clayton dropped a pass on 4th down inside the red zone, which may have led to the game winning TD and the necessary 27 points. In 2010, the Ravens squandered a 20-10 4th quarter lead. The TD allowed to Deion Branch put the Pats over the 16.9 point mark, which then helps propel them to overtime and the win. The Ravens always play him tough, but Brady always shows up big in the 4th quarter. Especially when it’s close. In last years playoff game, the Ravens met most of the criteria. Allowing less TDs than INTs. 61.1 completion %. Had Lee Evans not dropped the ball, they score the necessary 27 points. The blueprint for beating Tom Brady and the vaunted Patriots is in the 2009 playoff game. It’s the one game which all of the criteria were met. Held the Pats under 17 points, scored more than 27 points, Brady threw for less than 233 yards, under 61% comp.%, and more turnovers than touchdowns. On top of that, a game so out of reach that another 4th quarter comeback was near impossible. It’s the only sure way to win this game. Putting that behind us, Tom Brady has lost five games since last years AFC Championship. Here are the stats in those games, understanding that the sample is smaller here. So in those next five losses, Brady averages more yards passing, more touchdowns than interceptions, has upped his points per game in a loss, upped his completion percentage, and the defense is allowing about the same amount of points. There is that 27 again. However, if the Giants were using this blueprint last year in the Super Bowl, you would say that they would not have won. They didn’t score 27, they allowed 17, more than 233 yards passing, more TD/INT, better than 61% completion%. But you have Welker with the drop, and Manningham with the late game deep catch to set up the go ahead score. Arizona in week 2 of this season didn’t shut down Brady completely by the blueprint. But a late game penalty erased a Danny Woodhead TD and led to a Gostkowski FG miss. Same thing when they visited M & T Bank in week 3. Didn’t follow the blueprint then, but the Ravens won, basically by matching Brady blow for blow, having the ball last, and not having Billy Cundiff out there with the game on the line. In week 6, Brady had a pretty decent game against Seattle. It was the Pats defense that allowed 14 points in the final seven minutes to allow the Hawks to come back. It was a deep pass to Sidney Rice with a minute to play that took the lead. San Francisco got out to such an enormous lead, prompting Brady to throw 65 times to bring his team back, hence the 443 yards passing and 34 points allowed. It looks to me that there are two schools of thought here. Last week I broke down how to beat Peyton Manning, and we looked at his blueprint and his numbers over his ten playoff losses. Manning played well enough to win last week. He posted more yards, more TDs than INTs, a lot more points, even aided by the kick returns. (But there’s no telling even without those returns if maybe Manning leads scoring drives on those possessions anyway). But with the game on the line, the Baltimore Ravens made the plays, and Manning and the Broncos didn’t. The Jacoby Jones bomb, Manning’s untimely INT in OT. Again, Billy Cundiff isn’t our kicker anymore. And that is the other school of thought. Take the statistics and toss em out the window. Looking at all the numbers, I said last week that the first team to 26 points could win the game. Turned out not to be the case. The only game that matters is this one. All that matters is who makes the clutch play, and who breaks down when it matters most. In these closely contested games that the Ravens and Patriots usually play, that’s what it could all come down to. Who comes through in the clutch. Who has momentum on their side as the clock winds down in the final quarter. Or who makes the costly mistake. Basically, who wants it more? For sake of argument though, If you wanna stick with the Brady blueprint, if he goes 22-37, for 232 yards (10 yards per completion means no big plays allowed). 2 TDs, 2INTs, and lets sack him at least three times, I really like the Ravens chances. Or, it could be as simple as outscoring him. Like the Niners did, and like the Ravens did in 2009, put them in a deep hole early. Or have Flacco go shot for shot with him once again. If Brady scores 90, Joe scores 91. If you don’t believe in stats, and you don’t believe in clutch or momentum, maybe you’ll buy into this fact. Bunk Moreland from “The Wire” has been doing the Super Bowl promos for NFL Network. Are they trying to tell us something?